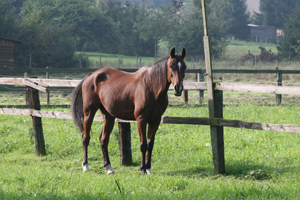 When Michele finally had enough money to buy her first horse (an Akhal-teke, of course), she looked at 3 or 4 places until she found him. I asked how she knew that was the one she wanted, and she shrugged. “You just get a feeling.” It was Peter Van Kasteren who sold her her first Akhal-teke long ago, “and he came with the horse!” They are married now, and have 40-something purebred Akhal-tekes on their farm in southern Belgium. While Michele always loved the Akhal-teke, she wasn't always into endurance. She took riding lessons when she was young, then got into eventing. Later on, when Peter took her to her first 120 km ride, she found out how painful endurance can be, if you weren't conditioned for it. “I went back to eventing!” “What?” I said, “But you eventers are crazy!” “Yes, but eventing doesn't last all day!” Eventually, however, Michele began competing in endurance on their Akhal-tekes when Peter took a break from riding. She started riding in international rides 3 years ago. 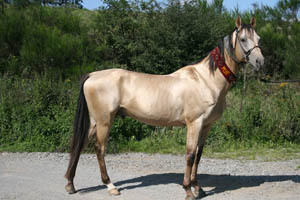 The two things that pique my interest in the Akhal-teke is their unique conformation, and that shimmering quality of their coat. While the many strains, or sire lines, of Akhal-tekes can be quite different, from a sleek greyhound look to an almost warmblood-type, I see in most of them the distinctive head and neck, head carriage, and floating way of moving. 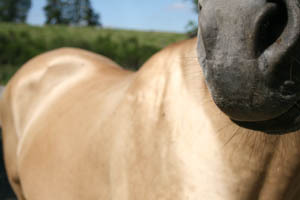 The metallic sheen in their coat is due to the unique structure of their hair follicles (unlike other horse breeds), a smaller, opaque core and larger, translucent outer covering, which refracts light – changes its direction - and focuses the light like a crystal. On some of the golden horses – like her stallion Myr – it's almost hypnotic. “Riding him in the sunshine is like truly riding gold!” said Michele. Michele still calls her Akhal-teke passion and breeding farm her 'hobby,' but with over 40 horses, it must be a full time job – and she already has one of those. In good weather seasons, (this was not one of them – with all the rain Belgium, and western Europe, has had, they missed a lot of training, and therefore a lot of rides) this is a typical day: Get up 3:30-4 AM, go for a ride, then go to full-time work as a lawyer in Luxembourg, ride at lunchtime (on a horse or two she keeps at a friend's near work), return to finish up work, drive the 60 km home, and then ride another horse or two at home. “The latest I got finished riding was at midnight!” That is dedication, or, perhaps, obsession - something I seem to find in many of the Akhal-teke people I've met so far. 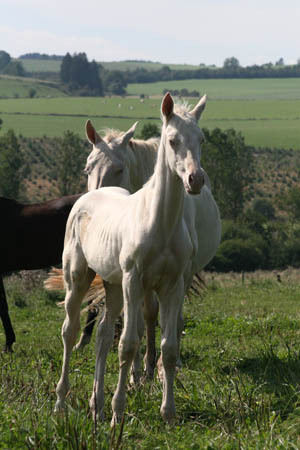 The Van Kasterens are on their 3rd generation of breeding Akhal-tekes. I asked which of all of them was her favorite, but Michele couldn't pick one. 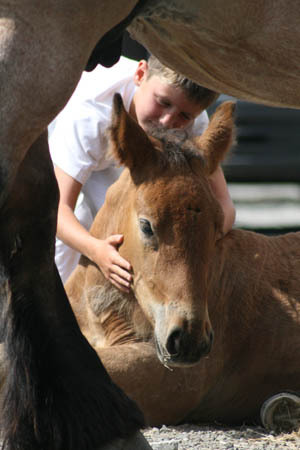 “They're all unique.” They aim to have 5 or 6 foals a year, keep two of them to raise and train and campaign in endurance. They have 5 in endurance competition now, and a herd of Akhal-tekes from yearlings to 5 years old, and a herd of mares turned out with their black 20-year-old stallion, Sugun (means “deer” in the Turkmen language). Throughout his career he performed in eventing and endurance, and showing. Sugun looks quite content with his lot in life right now! 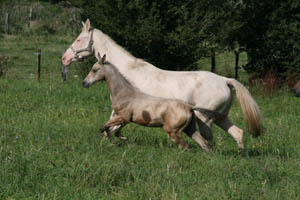 Most buyers like the buckskin or dun color, but, the Van Kasterens breed for performance, not for color. And while the Van Kasterens compete with their horses in endurance, they don't specifically breed just for endurance, but performance in general, whether it be dressage, jumping, endurance or eventing, believing that the Akhal-teke is a very versatile horse. Michele prefers to breed the mares young, get 2 or 3 foals out of them before breaking them in and starting them in endurance, since most Akhal-tekes don't fully mature till they are 7 or 8 – what we all like to think of as the beginning of the prime age for endurance horses. 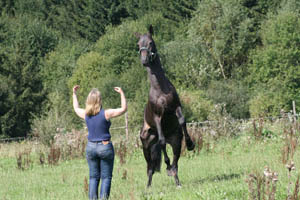 And, in general, the Akhal-teke is very easy to break, says Michele. “You just throw a saddle on their back. They turn their head back at you, say, 'Huh? What's that, a saddle? What, you're up there on my back? OK.' And off they go.” Of course it's probably a little more involved than that, but it goes with what others have told me of the Akhal-teke, that they are intelligent, quick to learn, and gentle. 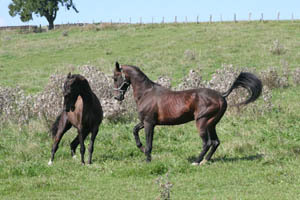 The Van Kasterens never have problems with them, such as bad feet, or colic – they've always been reputed to be tough horses throughout their existence. As people in a minority, the Van Kasterens sometimes feel like they're fighting an uphill battle in endurance (and other sports) with their Akhal-tekes, when people try to say the Akhal-teke is not so successful in horse sports. But Michele does offer a simple, valid argument. “Just look at the numbers of Akhal-tekes there are in the world compared to the Arabian.” (One figure sited is 3500 Akhal-tekes in the world while another says 1500; and as of June 2007, there are over 996,000 registered Arabians in the world). Looking at it that way, the odd Akhal-teke completing 100-mile rides – such as Sabel, in this year's Tevis Cup - is quite an accomplishment, just for the fact that the Akhal-teke was IN the ride in the first place. Without seeking them out, the Akhal-teke seems to keep finding its way into my endurance wanderings. 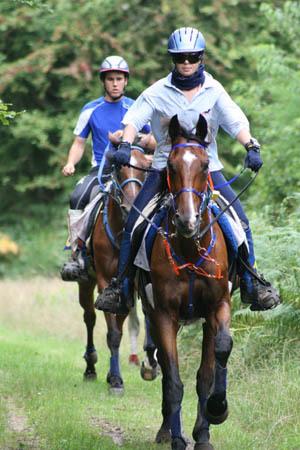 It just goes to show again that there many sides to endurance around the globe: the serious endurance racing and the casual family atmosphere endurance riding; the purebred Arabian and the alternative breeds like the Akhal-teke and the mule; the shaikhs who ride and the homeless who ride (and I'm not just talking about me here! ), the $1,000,000 Arabian and the $500 Arabian that would have gone to slaughter, $100,000 live-in horse trailers and the people that ride across country to get to the endurance rides (OK, so that doesn't happen so much now). There is a place for all of it. Endurance variety – the spice of life! 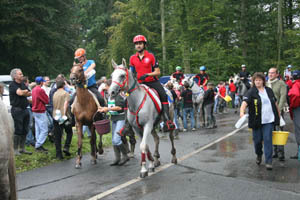 Sunday, just down the road in the village of Faulx-les-Tombs, Belgium, was a Fete de la Ruralite – a rural fair. 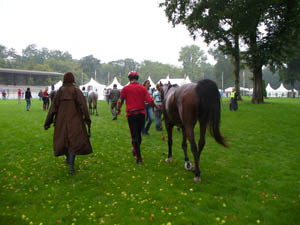 The focal point of the fair was a Belgian Ardennais horseshow. I'd gotten my first glimpse of the Belgian Ardennais, or the Ardennes, at the Libramont Fair a few weeks ago, and here was a closeup look at the attractive, big, strong working farm horse. 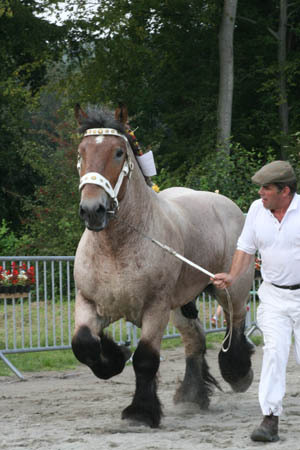 The breed originated in the Ardennes region of Belgium, France, and Luxembourg, perhaps 2000 years ago, and is one of the oldest of the European draft horses. 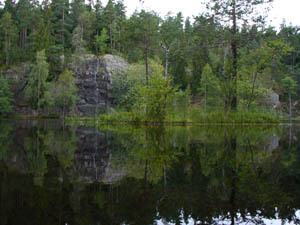 The Ardennais is still used today for farm work and logging. You could see that the handlers – most of them weathered old Belgium farmers (all wearing white) - regularly used their animals for work. 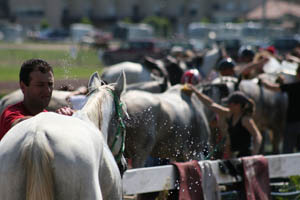 Many of the horses had their tails docked, presumably to keep it out of the way during work. 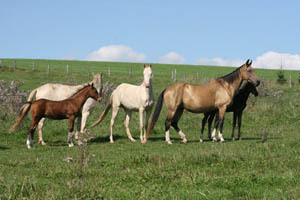 Many of the mares had foals at their side that roamed freely with them. 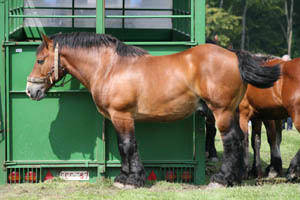 The average height is 15.1 to 16.3 hands, and the average weight 1500 to 2200 pounds - so, smaller than a percheron, but as compact and muscled and powerful. They come in all colors, though black is excluded from registration. The horses were judged on conformation and movement, judged by 3 studious men with a knowledgable eye. The breed is known for being docile, willing, and easy to handle, though I was surprised to see that a fair number of them seemed to be spooky, jumping at things like some Arabians I've ridden. But then, these farm horses probably aren't used to such a place, a busy fair, with people everywhere, miniature horses pulling carts, hay-bales flying through the air (a human throwing contest). A local marching band played (sitting under the tent). A little miniature horse was very busy giving little cart rides – with a companion Australian Shepherd clearing the way for him, nipping people in the legs when people didn't move. Saddled ponies gave rides to kids. You could join in the hay-bale throwing contest, watch the shoeing process of a Ardennais, take a mini-cart ride or a ride in a carriage pulled by two Ardennais horses, or get your face painted. There were fruit and vegetable stands, artist booths, an ice cream vendor, a candy vendor, and later in the day, a fantastic 4-piece New Orleans jazz band – here in the heart of Belgium! The crowd grew as the pleasant sunny day went on. Leo borrowed the key to the old church built in 1850, on the street overlooking the fair. It was beautiful inside, original stonework, nothing gaudy, just simple and cool and nice. We opened a side door and the 5 of us climbed up cobwebbed stairs to the balcony below the belfry – which I am pretty sure hadn't been visited since 1850! 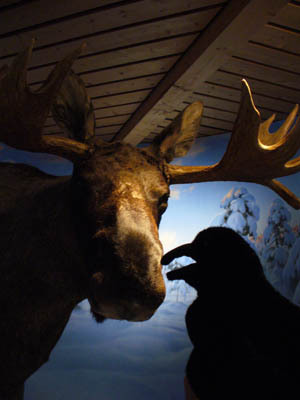 The 'floor' was 6 inches of bird and bat guano, with a smattering of desiccated bird and bat skeletons. 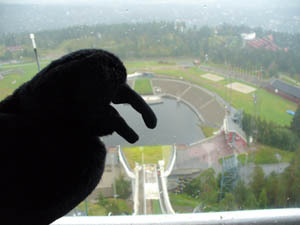 We creaked open a door to the little outside balcony – scaring the feathers off a nesting pigeon – and had a great view of the fair below. Leo dared to climb a very tall aluminum ladder even higher toward the belfry (I wonder how long the ladder had been there! ), but I preferred standing on the solid guano floor. What great character the church had! We ended our afternoon at the fair with a beer (or two) with the local Belgian community, sitting next to the arena where the Ardennais were still showing, with the 4-piece band jazzing away beside us. Nice way to spend a Belgian afternoon! This time my view of this important European ride, the 140-km Compiegne Teams Trophy, would be from the inside – behind the scenes, working as a crew for Leo and his horse Orfeo. I'd be one of the myriad people scurrying around at the vet gates and the crew stops, madly tossing and sloshing water, running with buckets bottles and grain and hay and blankets and crew gear. It was a great location for my first European crew experience: Compiegne, site of the World Endurance Championships in 2000, and the European Championships in 2005. If France is the European axis of endurance racing, then Compiegne might be considered the centerpiece of it all. Many people speak of great French rides: Florac, Ribiers, Compiegne; but invariably when they say “Compiegne” their eyes light up with a special fondness. Organizer and manager Nicolas Wahlen speaks of Compiegne the same way – he's very proud of his masterpiece, and rightly so. It's a technically challenging course, with tracks and riding lanes through state forest land - hilly terrain, sandy ground - and it brings top horses and riders from around the world to compete. In fact, said one rider, it might be more important than the European Championships for the sheer number of top French riders: at the European Championships there will be only 6 French riders; here there would be over 60 entered in the 140 km Teams Trophy. There would be a total of 84 entries, with riders from France, Spain, Belgium, Netherlands, Germany, Australia, Bahrain, Great Britain, Luxembourg, and Brazil. Leo and his son Julien, and Leo's horse Orfeo, had left early Thursday morning for Compiegne, and Caroll and I followed in the afternoon. We had a nice short drive of only 2 hours from Brussels to Compiegne... all under gray skies, and some rain. We tried to pawn the rain off in Belgium, but no, it was raining in France, too. Caroll was clever enough to stop at a sporting goods store and insist we buy rubber boots – which came in very handy on my first footstep outside the car on the venue grounds. It was a sea of mud! 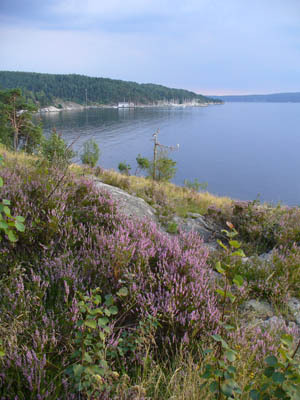 Looked like it had been raining here for a while – like maybe 3 months! But I happily sloshed through every mud pond (purposely) in my new boots. Caroll's car almost got stuck in thick gooey mud in the stable area, with wheels spinning. After the weekend was over, it looked like we'd been 4-wheeling instead of endurance racing! We spent the afternoon setting up our gear – trunks and buckets and horse blankets and grain and hay and water – in the grooming area and the rest area under our tent where Orfeo would spend his holds eating and resting. 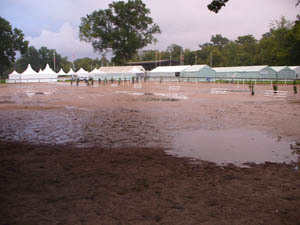 In the late afternoon, near the vet gates, in front of the grandstand of the equestrian stadium, the rider meeting was held in French and English. 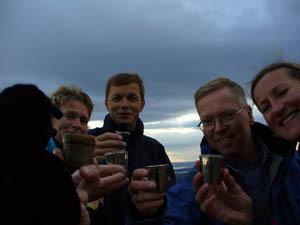 We imbibed at the refreshment tent, and greeted acquaintances. I'm getting to know some of the faces in this part of the world, cheek-kiss-greeting them like I know what I'm doing. But I've never been able to keep straight how many kisses you give: I think with the French it's two, the Belgians one, the Dutch zero unless they really like you and then it's three... I'm not sure what a French and a Dutch person who really like each other do when they greet. A large catered feast was held in another big tent – it was one big eating party with an astounding variety of food. The cooks had no problem keeping up with cooking and dishing out the hot main courses to the large numbers of people. We got to bed late, as usual – had to visit with a lot of people in the food tent and help empty some wine bottles! The morning start was at quite a reasonable hour, 6:30 AM, and so we were up at 5, and in the car by 5:15, headed to the venue about 7 km away from the hotel. 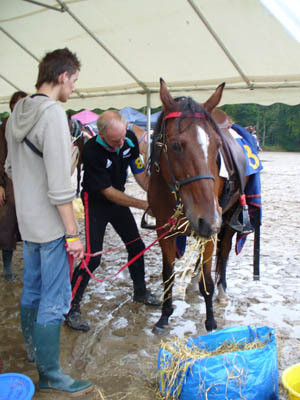 We downed a quick breakfast provided for the riders and crews, then slopped through the mud to the stables to get Orfeo ready. 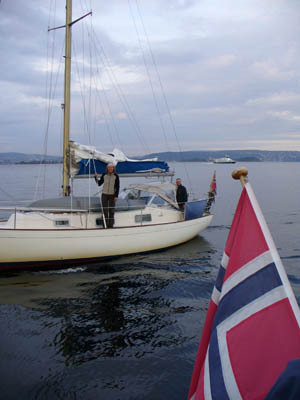 We greeted the other members of Leo's team, stabled nearby; and once Orfeo was saddled, we crew followed him and Leo to the starting line. It wasn't raining, but was heavily overcast, and very muggy. 84 riders left the starting line right at 6:30 for their first 32-km loop. As the crew, we didn't go out driving on this loop. It would be too rushed, said Caroll; better to stay here and make sure we're organized, and be ready for Leo to come in off this first loop, which would likely be pandemonium. Besides, Orfeo wouldn't be drinking on the first loop anyway. We expected them to come in to the first vet gate at about 8:30, and we spent most of that time making sure everything was ready. There were just a few people around – for the first hour – and the atmosphere was quite relaxed – no indication of the tumult to come. Cool jazz – Louis Armstrong - was playing on the venue speakers. 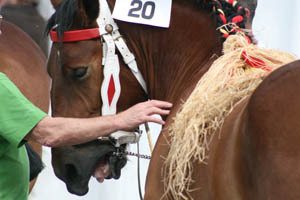 Around 8 AM crew cars started arriving from the first loop, and humans began trickling into the grooming area, people greeting people, waiting, visiting, all of them (us) draped in crew jewelry: horse blankets, halters, lead ropes, heart monitors as necklaces, stethoscopes, saddle racks. 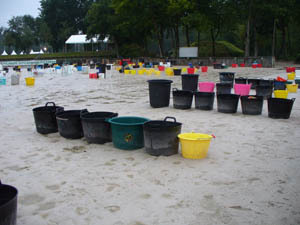 We carried water bottles, water buckets, grain buckets... and we waited. There was lots of cigarette smoking going on... nervous crews? The first 5 riders came in at 8:23, (3 of which were eventually eliminated), then 3 more riders a few minutes later, then a cascade. 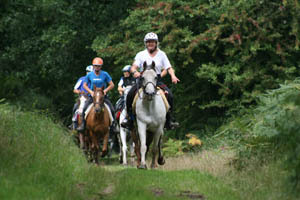 A throng of purposeful riders and horses and crews, all going different directions, and I was right in the middle of it! Here came Leo and Orfeo... I successfully got his saddle off without forgetting to undo the cinch or something (it was easy, he had no breast collar), or dropping the saddle in the mud! Orfeo didn't want water, or hay, or cooling off... he wanted grain, we found out later! However, it was time to cool him down, get his pulse down to 64, and time the long walk to the vet gate just right. There was a crowd at the vet gate, but Orfeo entered and stopped the clock, with plenty of room inside to wait for the team of vets. 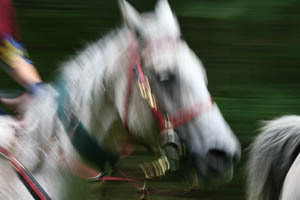 When they emerged, Leo said Orfeo's pulse was 48 – not bad for an old horse. Then it was time to resaddle Orfeo, and they were off, headed for the out gate, and we the crew were off in the car to meet them on this second loop of 33 km. Caroll's car was crammed with water containers and extra horse gear, and her back seat was really not quite designed for a third person! Going by the road book (Julien reading, not me! ), we found our way to the first appointed crew stop, which was very busy already with lots of people setting up, cars parking on the sides of the roads and on any available grassy spots. We pulled out our prepared water bottles and bucket we'd need; and Julien and Caroll went up the trail a bit with the bottles, and I stayed back with the drinking water for Orfeo. Soon, here came the leaders, and not too many minutes behind them, Leo. 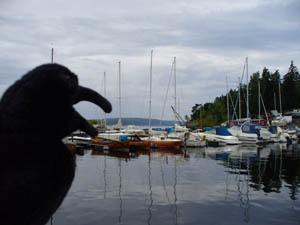 Orfeo wouldn't drink, and in fact stuck his nose in the bucket and lifted it up in the air, spilling most of the water on his face and chest, expressing his disdainful opinion about drinking at a time like this. At the crew stops, all the crews stake out their little territories, strategically placing themselves at a specific spot where they think will most benefit their riders, and set up. 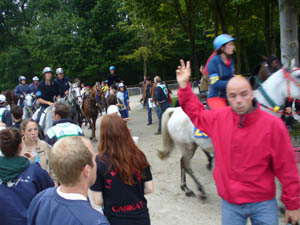 Then they wait: hanging out, visiting, yakking, loitering, and seemingly enjoying the atmosphere (though the mood here at Compiegne isn't quite relaxed) – but the instant the first rider is spotted, the call goes up and everything changes. Murmurs shoot through the crowd and it suddenly turns into a beehive that's been whacked, with all the frantic activity – people swarming, running with buckets, waving at riders, yelling at riders, people sprinting alongside and after horses; horses stopping to drink, horses darting through the crowd, empty water bottles flying, horses shooting through and out of the beehive, dodging people and cars and each other. 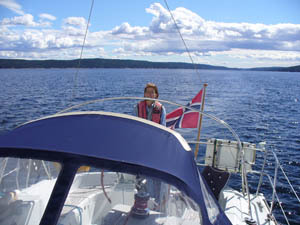 We jumped in our car raced on to the next crew point, and there I stood with Sabrina Arnold's parents this time, back out of the way, giving the leading horses and crews plenty of room. 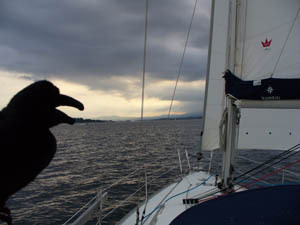 Sabrina and Leo arrived together, and again Orfeo wasn't interested in drinking, only had a swallow or two. It was cause of slight consternation from Orfeo's rider and crew. After they cantered off, we crew raced back to the venue and waited for them to arrive off this second loop. Loop 3, while the other horses went out on the 20-km trail and their crews out on the road, we packed up our things and loaded them into two cars, drove everything back to the trailer and unloaded there. Alain Porras on our team was eliminated by lameness on this loop, leaving us with 2 girls representing Team Omega. By the time the leading horses were headed out on loop 4, we were done with our work and now found ourselves as casual observers. Caroll helped crew for some other Belgians, and Leo and Julien and I went out on the loop to take pictures. 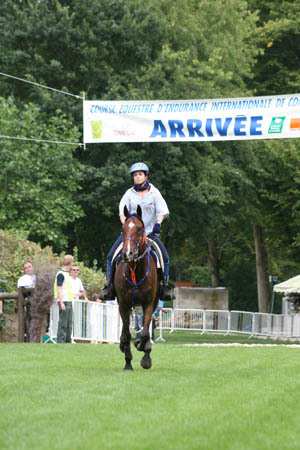 Cantering past us in first was Spain's Maria Alvarez Ponton, on her gelding Julius De La Drome, who'd finished 3rd in the 160 km at Compiegne last year, followed by Nicolas Vazquez on the mare Orsane D'Angelique, and Alex Luque, on his horse Atiklan, who finished the 160 km ride at San Galmier a month ago. At the end of the 32-km loop 4, the 3rd member of our team, Geraldine Brault vetted out for lameness, leaving only Sabrina Arnold of Germany left. Sabrina had been moving up steadily all day, from 23rd place, to 22nd, to 15th, and was now in 8th place. Our dispossessed crew now had time to sit and watch the race, visit people, have a beer or two, take a picture here and there, and catch the riders going out on the final 21-km loop. Fifteen riders went out within 3 minutes of each other, galloping out the gate in hot pursuit of the one ahead, with Nicolas Vazquez leading the charge. It looked like it could be a very close finish... what kind of strategy do you use on a last loop when you're all so close? 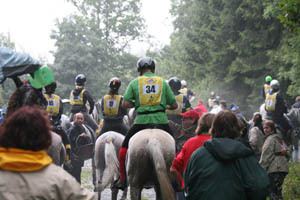 It would likely all come down to what their horses had left, instead of what the riders had planned. Just over 45 minutes later, a wave of excitement brought people to their feet and running to the rail of the finish for the first rider coming in: French rider Julien Lafaure on Jasmina Cabirat, who moved from 15th to first place. But the effort was too much for his horse, who did not recover and vetted out on metabolics – a tough break. 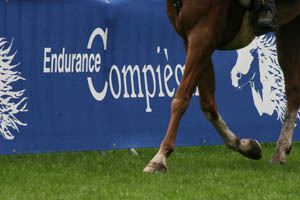 One minute later, Spain's Maria Alvarez Ponton trotted across the finish line; due to Lafaure's elimination, she became the winner of Compiegne, followed four minutes later by Nicolas Vazquez. 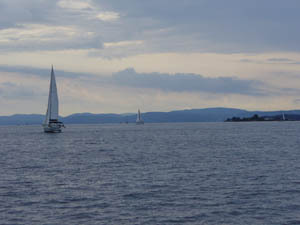 Six minutes later, Sabrina Arnold approached the finish line with a few lengths' comfortable lead over Sophie Arnaud; but Sabrina misjudged the finish line, slowing her horse some 30 meters short of the electronic timer. Sophie was the first to realize Sabrina's mistake, and urged her horse to a gallop, and just passed Sabrina right before the finish line. Tough luck for one horse and rider, great luck for another. There were a few mildly contested sprints for the finish, but anti-climactic after the rousing race out of the last vet gate. 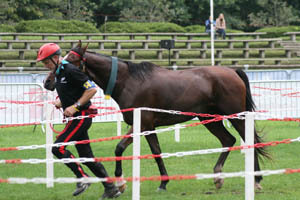 Several horses looked quite spent as they crossed the finish line. Two more finishers vetted out at the finish line for lameness. 46 of 84 finished, with the winner Maria Alvarez Ponton averaging 18.09 km/hr. The team she was on, Germ Tonic, finished 3rd, with 3 riders across the finish line. 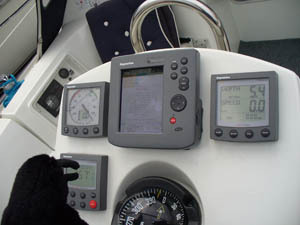 The French Tomas Team finished first, and the Royal Team of Bahrain took second. Dinner, certainly one of the highlights of Compiegne, was another big, boisterous, monstrously catered affair. Orfeo got his own good dinner of grain, hay and silage, and some carrots I borrowed from his next door Belgian horse neighbor. 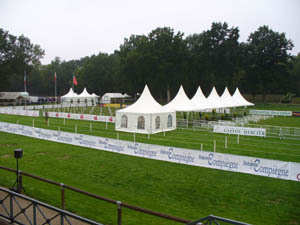 The next morning, our ride experience at Compiegne complete, we finalized our packing, while dozens of trailers full of new horses and riders were arriving for Sunday's 119-km Young Horses Championship, for 7 and 8-year-old horses. There would be 107 entries with high stakes; many riders could expect good offers on their horses that finished near the top. 56 of 108 would end up finishing, with the winner averaging 18.8 km/h, and 7 of the horses eliminated at the finish. 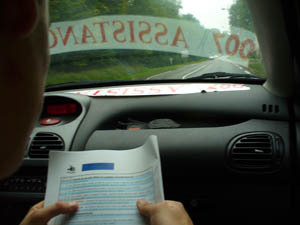 We would not be staying for the Sunday ride, because our Compiegne adventure was over, and we were headed home. My first experience at crewing, European style, even if it was just a taste, for the first 2 loops, wasn't bad, especially since it was at Compiegne. I can see how it grows on you, both the crewing, and the fabled venue and occurrence that is Compiegne! 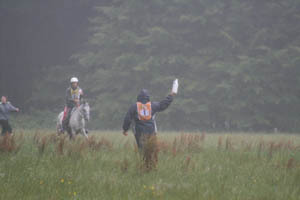 That would be me, for the first time, Crew Extraordinaire, for Belgian Leonard Liesens and his horse Orfeo in the 140 km CEI*** Teams Trophy of Compiegne 2007! I would be the embedded reporter on the battlefield. Actually I would be the third wheel crew person behind Caroll and Julien (Leo's son), but it would still be my first time crewing in Europe! Come to think of it, I've only crewed a few times in America, and our crewing is certainly lower key than in Europe, especially in France, and most especially at Compiegne! 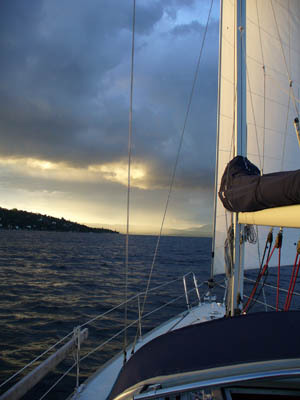 What a place to be crew-initiated! 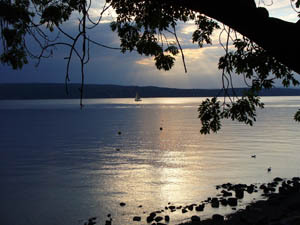 Leo's team of four consisted of himself, Alain Porras from France, Geraldine Brault from France, and Sabrina Arnold from Germany. 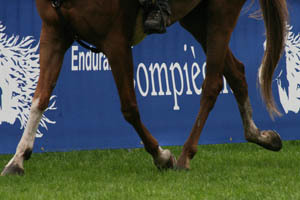 Leo would be riding his great horse Orfeo des Iviers, an 18-year-old bay gelding who's been around the endurance block. Orfeo and Leo met in Orfeo's younger days, after he'd thrown and killed his rider. 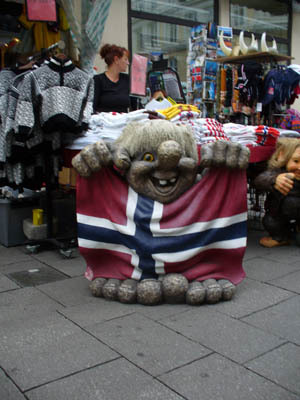 Leo bought him for 3000 Euros. He was a difficult horse to ride at first, but with a lot of work, he turned into a very good endurance horse, very forward, all business on the trail – in the endurance rides, anyway. In training rides you can see he still has a few of his own opinions – as does Leo! - but they complement each other and work very well together. I had the special treat of riding Orfeo one day in the Belgium forest, and he was delightfully pleasant and fun to ride. 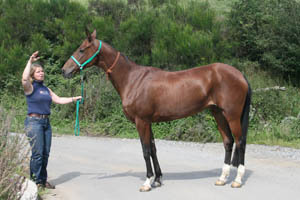 He's a narrow, angular Arabian, maybe 15 hands, with a long face and a long, ground covering, comfortable canter. In his career, Orfeo won 4 3-star endurance races, including 2 160-km races, and the 2000 Belgian Championships. They finished Top 10 in the 1999 European Championships in Portugal, Top 10 in the 2000 World Championships in Compiegne, and won the 140-km in Compiegne in 2003. 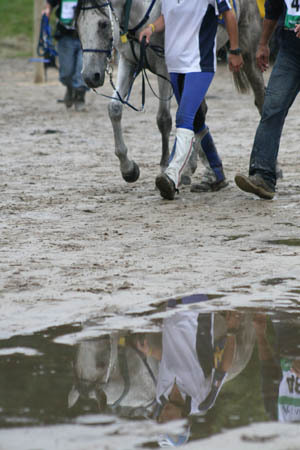 They made the Belgian team selection 6 times, and Orfeo participated in a total of 2 European Championships and 4 World Championships. Not bad for a little bay horse. Leonard himself didn't always like horses. Leo's previous wife and kids had gone to stables to take riding lessons, but at the time he wasn't interested at all. Then one day about 10 years ago, he went to a country fair and saw Arabian stallions in a show, and said, “WOW! 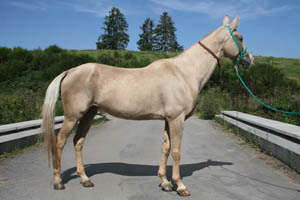 I must get me an Arabian!” In 3 months he had bought a young Arabian mare. He started taking riding lessons, and studying books by the great classical dressage instructor Nuno Oliveira. 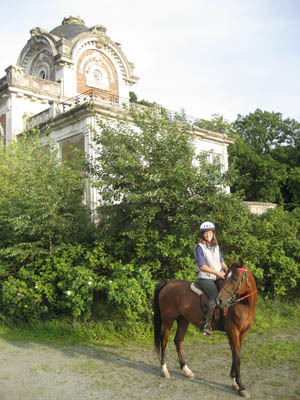 While continuing to improve his riding with instructors, Leo broke in his mare, and used her for trail riding. 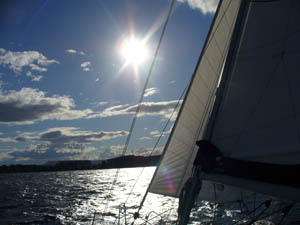 He wondered what else he could do with her, and then one day heard of endurance. He tried it, and, as happens with most of us, he was hooked. From there he got Orfeo, and then he met Steph Teeter, who invited him to America to do some rides... including his first 100 mile ride, which was the Tevis Cup. He and Steph finished that ride in 21 hours, still his longest ride ever! He also rode the 3-day historic Outlaw Trail ride, where on one of the days he and his horse got bogged down in quicksand (it took several people to pull the horse out.) Since then, Leo's ridden all over the world, including (besides Europe and America) Dubai, Malaysia, New Zealand, Algeria. 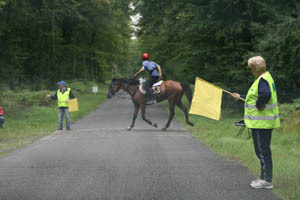 And here I was at Compiegne, crewing for them! “What do I do?” I asked. “I don't want to do anything wrong!” I mean, what if I lose vet cards? What if I do something wrong that loses valuable time in getting Orfeo's heart rate down? What if I get lost in the swirling chaos of a vet gate and cool down the wrong horse? What do I do at a crew stop on a loop?